This is an "armchair visit" with Esther Campbell rather than a complete history. Esther, like many pioneer women, lived and flourished in conditions many of us have never known, or can even comprehend. We take so much for granted these days. We are comfortable and wasteful in our daily lives. "Miss Esther" is a combination of Esther's own words, as told firsthand to Carole L. Jackson, from manuscripts she shared with others, from Doris Burton's Blue Mountain Folks, and from Vernal Express articles. Written in "first person" with Esther's permission. 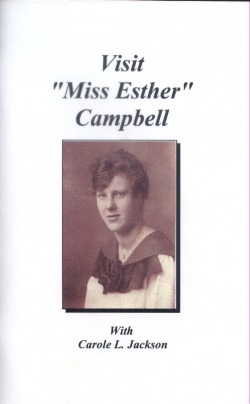 Sit back and enjoy a visit with "Miss Esther" Campbell. Booklet, c1994, 80 p. : ill. ; 14 cm.